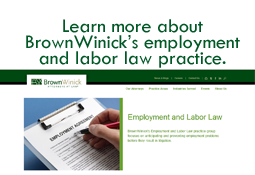 Workplace Wise - BrownWinick Employment Law Blog: Federal Overtime Rule Blocked! Late yesterday, a federal court in Texas issued a nationwide injunction blocking the Department of Labor’s new overtime rule. This rule aimed to raise the Fair Labor Standards Act’s (FLSA’s) salary threshold for the white collar exemptions from overtime pay from $23,660 to $47,476 per year. This means that if you were contemplating re-classifying your employees due to a salary shortfall, you don't need to do that....yet. We expect that the matter will be appealed but in the meantime, employers should follow the existing rule. Click here for a summary description of the existing rule. Should you have any questions about the Order or its impact on your business, please contact Elizabeth A. Coonan, Ann Holden Kendell or the Brown Winick attorney with whom you work.